OK, so the first single off the new album, ‘Party Like A Russian’ seemed like an odd choice to be released as the first single and also it only reached number 68 on the Official UK Singles Chart. My first thoughts were: “Um… Robbie? I’m not sure about this one” – however after a few more listens, it actually has grown on me. Seriously, I really do like it. No, honestly I do. It’s incredibly tongue in cheek and that’s how Robbie Williams has been since he was first launched into the music industry all the way in 1990 as part of the five members of the UK boy band, Take That. Anyone who personally knows Robbie or has been a long time fan of his or even watched him on talk-shows and in interviews, can immediately see that guy just never takes himself seriously and everything he does is tongue in cheek fun. He’s cheeky and he knows it. 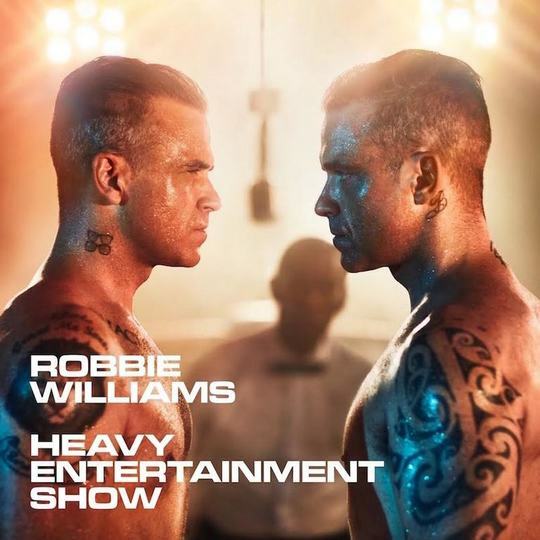 The Heavy Entertainment Show is Robbie’s 11th studio album and he has made chart history in the UK latst week as being the only British solo act to have 11 number one albums. Not too bad for a lad from Stoke-on-Trent (where Robbie was born and raised in the United Kingdom). 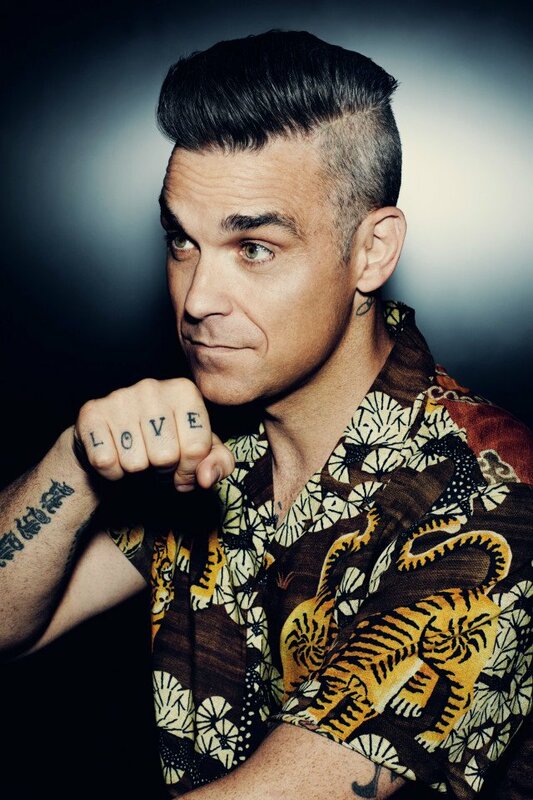 Says Robbie Williams about the new album, which see’s him reunited with the brilliant Guy Chambers, co-author of hundreds of smash hits from the Robbie back catalogue. The Killers co-wrote alongside with Robbie for the song, “Mixed Signals” which sounds basically like an open-road epic, while alongside with Ed Sheeran who co-wrote “Pretty Woman” is like a stomp-twang Avicii-lite song that will have you bopping along to in your seat in your car. Other highlights are the brilliant ‘Bruce Lee’ which is a bit of head banger, ‘Sensitive’ which is produced by the super producer Stuart Price and its also Robbie’s return to electronica music (one that he really doesn’t get enough credit for – the Rudebox album is underrated and the album that he did with Take That, back in 2011 on ‘Progress’ one of the best albums of the past 10 years). It’s seriously that brilliant. ‘When You Know’ is almost up there with the classic, ‘Angels’. It was written for his wife Ayda Field, the woman that completely stole his heart and transformed him. Robbie is one of the few artists that doesn’t stick to mundane album formulas, he will sing songs of any type of musical genre and the sometimes the lyrics are completely daft, weird or make no sense but that works for Robbie, whereas if it was another artist they would sink and never heard from again. In the heart of it all, Robbie is confident that his son will “break the chain” of sin and hopefully not follow in his own past mistakes. Just forget about the explicit title of the song and the lyrics, the song really shows a lot of heart and warmth and incorporates his cheeky demeanour as well. Is this Robbie’s greatest album that he has ever recorded as of to date? No its not but its still a really good album, and I seriously enjoyed it and had it on repeat. Don’t buy into what the harsh critics have been saying about the album. Listen to it on iTunes or Spotify first and give it a go. He is one of the smartest and wittiest lyrical song writers around who actually doesn’t get much credit for, and for what he sings in a-lot of his songs (the cheekiness, naughty and silly lyrics) throughout the years, only Robbie Williams really could get away with it. He isn’t crude, he isn’t loud. He’s just… well, cheeky. And after twenty six years in the music business, Robbie is still one of the most likable acts around, a real entertainer and truly one of a kind.